One of the best ways to ensure that your Magisto movie winds up looking fantastic is to learn a few tips about how to shoot video. We’ve compiled a list of 7 tips for shooting great video footage. 1. Get to know your video camera – Set aside some time to really learn how to use your video camera. Sit down with your camera and manual and go through it, trying out all the features that you may not have used before. Who knows, you may just learn some cool new tricks! 2. Use a tripod to avoid shaky footage – While Magisto does have image stabilization built in, you can avoid shaky footage altogether by putting your camera on a tripod. When you use a tripod this also frees up your hands so you don’t have to stand behind the camera—you can get in front and take part in the action! 3. Practice camera movements – Take some time to practice panning from side to side and zooming in and out. Use slow, steady, fluid motions. Many people zoom and pan too quickly and it can be nauseating. Additionally, remember that you don’t want to be moving the camera all the time. Frame your shot and leave the camera still to capture the action. 4. Composition – The Rule Of Thirds – The rule of thirds is an easy way to find a nice way to frame your shot. This camera composition technique divides your frame into 9 equal sections with 2 horizontal and 2 vertical lines, as in the image below. Subjects should be aligned at the intersections of these lines for the most visually appealing shot. When shooting a person, specifically one that is talking to the camera, you have to keep headroom in mind. Headroom is the amount of space between the top of the person’s head and the top of the screen. Too much or too little headroom can ruin a shot. 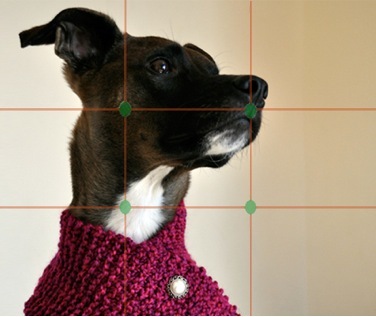 Think about the Rule Of Thirds and imagine that you are lining up the subjects eyes with the top horizontal line. In the image below you see that on the left there is too much headroom and on the right there is too little. The center is just right. - Natural light is best, so even if you are shooting inside during the day you should try to get as much sunlight in through the windows. - If you are shooting outside during the day, keep the sun behind your back and shining on your subject. However, it may be best to avoid shooting during midday when the sunlight is at its strongest to avoid harsh shadows. - At night you can use lights and lamps inside to create as much light as possible. 7. Tell a story – The best videos tell a story. Therefore, before you begin shooting footage for your Magisto video, think about the story you want to tell. For instance, if you want to tell the story of an event then you’ll want to get footage of as many of the people at the event as possible, as well as the location, the activities and anything else that you’ll want to remember and share. If you want to make a great pet video be sure to get a lot of different shots of your cat, dog, goldfish, or hamster in action, doing all sorts of different things. Keep your story in mind while you’re shooting to make sure you get everything you need. 8. Always shoot more than you think you need – It’s always better to have more than enough footage than not enough. When you know you’re going to shoot some video come armed with a full battery and plenty of free memory and shoot as much as possible. This way you’ll have more great footage to choose from so that the stuff that makes it into your final clip really is amazing!